Electrosonography (ESG) utilizes a kinesograph to measure intracapsular TMJoint sounds against normalized data,duration of these sounds, exact location of the occurrence of these sounds during jaw opening/ closing, or lateral excursions, and a spectral frequency analysis of the sound. Without this information, one could not restore function free of intracapsular interference resulting in decreased muscle tenderness on palpation, an increased range of motion free of restrictions and resolve patient complaints of pain). A pair of ultra sensative transducers are held in place by a lightweight headset over the temporomandibular joints. Vibrations from each joint during opening and closing of the mandible are monitored by the transducers, amplified and inputted into a computer for display, analysis and data storage. The joint sounds are analyzed by the computer in terms of amplitude and frequencies present relative to occurrence in the opening and closing cycles. It is a valuable adjunct used in conjunction with other clinical diagnostic modalities to confirm such conditions of joint pathology. There is a broad body of literature that supports the use and efficacy of sonography in the diagnosis of temporomandibular joint disorders. (Over 30 studies ending with Bracco, et al in 1997). Dr. Widmalm’s research at U. of Michigan using the K7 and a B & K system (recognized as the gold standard in the field of sound/vibration analysis) has shown ESG to record clinically signficant joints sounds vibrations below 50 Hz. Sound vibrations of the temporomandibular joints can be recorded when the jaw is opened and closed. Electrosonography (ESG) is able to record joint sound of the temporomandibular joint. Amplitude, frequency, duration and location of joint sounds can be recorded to identify and quantify various levels of joint health. Sonography utilizes a kinesograph to measure intracapsular TMJoint sounds against normalized data, duration of these sounds, exact location of the occurrence of these sounds during jaw opening/ closing, or lateral excursions, and a spectral frequency analysis of the sound. Without this information, one could not restore function free of intracapsular interference resulting in decreased muscle tenderness on palpation, an increased range of motion free of restrictions and resolve patient complaints of pain). A pair of ultrasensative transducers are held in place by a lightweight headset over the temporomandibular joints. Vibrations from each joint during opening and closing of the mandible are monitored by the transducers, amplified and inputted into a computer for display, analysis and data storage. The joint sounds are analyzed by the computer in terms of amplitude and frequencies present relative to occurrence in the opening and closing cycles. It is a valuable adjunct used in conjunction with other clinical diagnostic modalities to confirm such conditions of joint pathology. High amplitude low frequency temporomandibular joint sounds indicate soft tissue sounds. Low amplitude high frequency temporomandibular joint sounds indicate grating, crepitus (bone on bone) sounds. The recording of temporomandibular joint sounds is a recommended standard of care protocol for the evaluation of joint status prior to TMD and occlusal therapy. Bell (1986), Fricton (1988), Talley (1990) [See Position Paper, Craniomandibular Disorders: Guidelines for Evaluation Diagnosis, and Management, American Academy of Craniomandibular Disorders, 1990]. Joint sound will present as either clicking and/or crepitus. Recording of temporomandibular joint sounds provides valuable documentation of the existing FUNCTIONAL and MORPHOLIC status of the joints. Ciancalgini et al (1987), Gay et al (1997), Huttta et all, (1987), Oster et al (1984), Ouelete (1974), Rohlin and Estesson (1985), Watt (1980), Wildmalm (1992). For many years, the stethoscope was the instrument of choice to detect joint sounds. Bell (1986), Kopp (1977), Mongini (1984). Oster el al (1984) used a stethoscope and arthorgrams to correlate condyle/disk relationships with joint sounds. Even to trained ears, TMJ sounds are difficult to evaluate, subject to variable operator hearing and interpretation, and impossible to quantify and capture for the records. Ciancalglini (1987), An oscilloscope was used to display TMJ sounds in several early studies. The data was inconclusive because the sound recordings could not be related to the position at which the sound was generated. Ekensten (19520, Watt (1963), Later Watt (1967) correlated mandibular movement and joint sounds using ultra high speed cinematograhpy. Gay et al. (1987) combined two separate vibration transducers with the Myo-tronics Mandibular Kineseograph interfaced into a tape recording system to simultaneously record mandibular position and joint sound. The authors concluded that the most important parameters for establishing correlations were the acoustic signal versus the vertical dimension of jaw movement. Synchronous recording of mandibular movements and TMJ sounds greatly enhances the clinical assessment of patients with TMJ dysfunction. Gay et all (1987), Watt (1980). Recording, processing and storing ofTMJ sounds that can be correlated to mandibular movement was made possible in a clinical setting when finely balanced bilateral vibration transducers were interfaced with the personal computer in 1991. Ekensten, B. Phonograms of anomalies of the temporomandibular joint in motion. Scand J Dent Res. 60 (4):235,1952. Watt, D.M. Preliminary report on the ausculation of the masticatory mechanism. D Practitioner and Record. 14:17,1963. Oullette, P.L. TMJ sound prints: electronic ausculation and sonographic audiospectral analysis of the temporomandibular joint. J Am Dent Assoc.89:623-628,1974. Oster, C.; Katzberg, R.W. ; Tallent, R.H.; Morris, B.J. ; Miller, T.C. and Hayakawa, K. Characterization of temporomandibular joint sounds. Oral Surg. 58:10-16, 1984. Gay, T. and Bertolami, C.N. The spectral properties of temporomandibular joint sounds. J Dent Res. 66:6, 1987. Farrar, W.B. Characteristics of the condylar path in internal derangements of the TMJ. J Prosthet Dent. 39:319-323,1978. Farrar, W.B. and McCarty, W.L. Inferior joint space orthography and characteristics of condylar paths in internal derangements of the TMJ. J Prosthet Dent. 41:548-555,1979. Debont, L.; Boering, G.; Liem, R. and Havinga, P. Osteoarthritis of the temporomandibular joint: a light microscopic and electron microscopic study of the articular cartilage of the mandibular condyle. J. Oral Maxillofac Surg. 43:481-485, 1985. Gay, T.; Bertolami, C.N. ; Donoff, R.B. ; Keith, D.A. and Kelly, J.P. The acoustical characteristics of the normal and abnormal temporomandibular joint: diagnostic implications. J Oral Maxillofacial Surg. 45:397-407, 1987. Watt, D. Gnathosonics Diagnosis and Occlusal Dynamics. New York: Praeger, 1981. Drum, R. and Litt, M. Spectral analysis of temporomandibular joint sounds. J Prosth Den. 58(4):485-494, 1987. Chu, M.L. ; Gradisar, I.A. ; Railey, M.R. and Bowling, G.F. Detection of knee joint disease using acoustical pattern recognition technique. 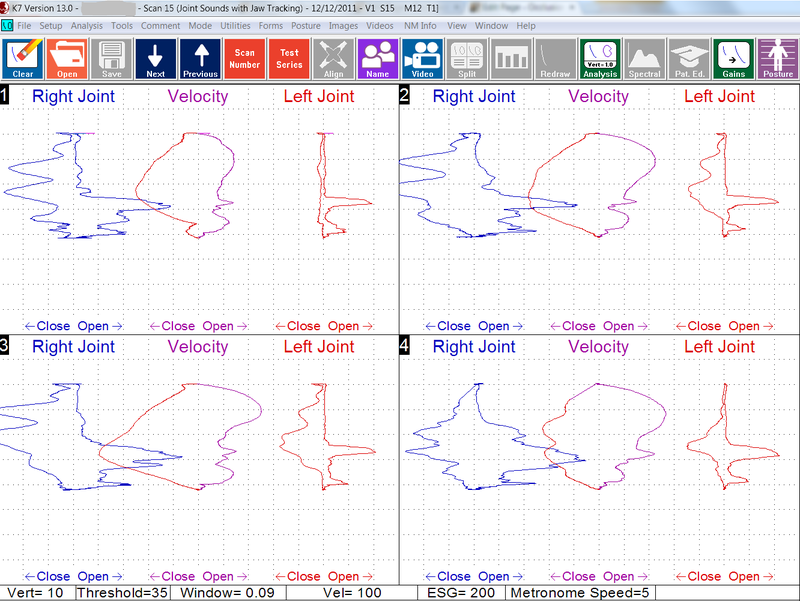 J. Biomechanics. 9:111-114,1976. Chu, M.L. ; Gradisar, I. and Mostardi, R. A non-invasive electroacoustical evaluation technique of cartilage damage in pathological knee joints. Med Biol Eng Comput. 16:437-442,1978. Blaustein, D. and Heffez, L. Digitized sonography of the temporo- mandibular joint. J. Dent Res. 65:335,1986, abstr. no. 1496. Gay, T. and Bertolami, C.N. Arthrophonometry of the TMJ. J Dent Res. 65:851, 1986, abstr. no. 1132. Lynn, J. TM joint digital sonoarthrography: application, technique and diagnosis. 1989 (in press). Hutta, J.L. ; Morris, T.W. ; Katzberg, R.W. ; Tallents, R.H. and Espeland, M.A. Separation of internal derangements of the temporomandibular joint using sound analysis. Oral Surg, Oral Med, Oral Path. 63-2:151-157, 1987. Mollan, R.A.B., McCullagh, G.C., and Wilson, R.I. A critical appraisal of auscultation of human joints. Clinical Orthopaedics and Related Research. 170:231-237, Oct 1982.